When loggerheads laid their 2,800th nest on Georgia beaches July 12, reaching a recovery milestone, DNR Sea Turtle Program Coordinator Mark Dodd predicted the season total would end up north of 3,000. Only a week later, that prediction became reality. 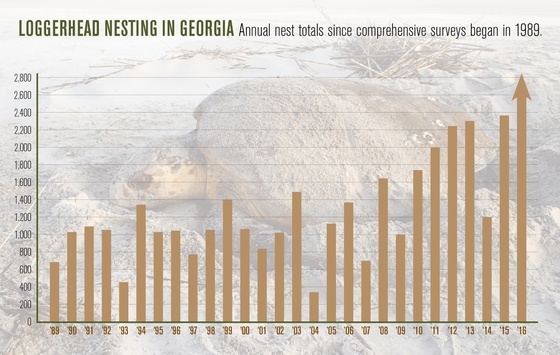 As of Monday, the Georgia Sea Turtle Cooperative – a small army of beach-patrolling staff, interns and volunteers – had documented more than 3,100 loggerhead nests. With nesting season winding down and hatching ramping up, the record total is more evidence these threatened marine turtles are recovering. DNR highlighted that rebound on social media last week in the #7Days4SeaTurtles campaign. Check out the posts, including this hatchling video, on Facebook, Twitter, Instagram and Flickr. 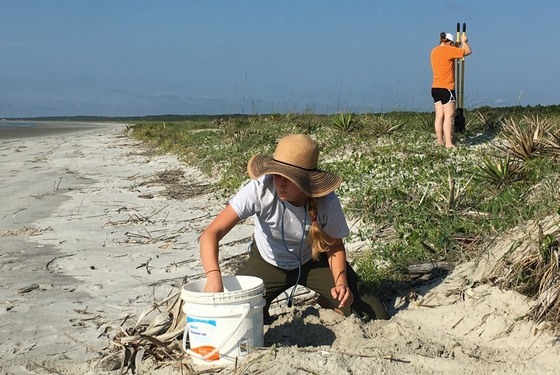 And for a glimpse of summer as a sea turtle tech, read this Sapelo Island blog. Conservation of animals not legally fished for or hunted in Georgia – including sea turtles – is spearheaded by DNR’s Nongame Conservation Section. Yet this part of the agency depends largely on fundraisers, grants and donations. One of these best ways to support this work, and spruce up your car or truck, is to buy or renew an eagle or hummingbird license plate. These tags cost only $25 more than a standard peach plate. Buy a tag and show your support! Children like to color. Children like wildlife. It’s no surprise then that DNR’s new “Exploring Georgia’s Wildlife” coloring book is a natural for children, for fun and education. The book, available online and created with a grant from the Nongame Conservation Section friends group TERN, follows a boy and girl as they discover wildlife wonders in their yard and across the state. A wildlife license plate on the car highlights the importance these tags play in funding conservation. “Exploring Georgia’s Wildlife” will engage children of all ages, third-grade teachers will find it particularly useful because the content covers life-science habitat and ecoregion curriculum standards. 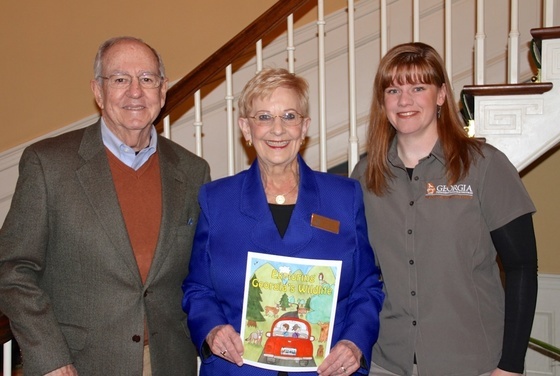 Nongame Environmental Outreach Coordinator Linda May worked with Georgia artist Ami Flowers to create the book. Eighteen-year DNR employee Rusty Garrison has been appointed to replace retired Wildlife Resources Division Director Dan Forster. Garrison has served as assistant chief of the division’s Game Management Section and state coordinator of Project WILD, and most recently managed Charlie Elliott Wildlife Center in Mansfield. DNR Commissioner Mark Williams said Garrison brings “a wealth of experience, leadership and vision" to the agency charged with conserving, enhancing and promoting Georgia's wildlife resources and outdoor heritage. 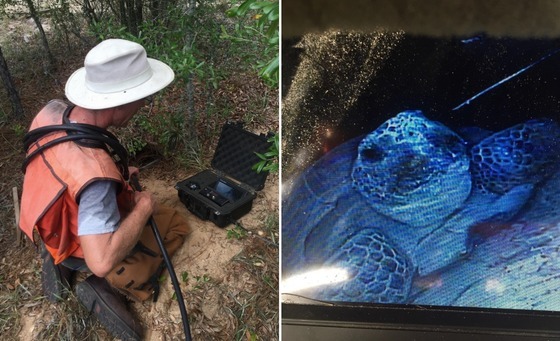 Neither heat nor gnats nor glare of day … DNR continues to research the status and distribution of gopher tortoises in Georgia. The survey crew found 20 tortoises – including the one on camera above – in three days of walking transects and scoping burrows at Flint River Wildlife Management Area near Vienna. Betty’s Creek in northeast Georgia will run clearer because of a project that has improved and limited the need for livestock stream crossings on Sutton Branch, a tributary. The work by DNR, the U.S. Fish and Wildlife Service, Project Orianne and Rabun Gap-Nacoochee School will reduce sediment and livestock waste in both streams. Betty’s Creek is one of the highest-quality waterways in the Little Tennessee River drainage and home to five state-protected fish and amphibians. A red-cockaded woodpecker has moved onto the DNR-owned part of Moody Forest Wildlife Management Area, the first time the endangered birds have been seen at the tract since the state acquired it in 2001 and an indication that habitat improvements are on track. Nongame Conservation Section biologists saw signs that a red-cockaded woodpecker had been using an artificial cavity at the site, and staff of The Nature Conservancy, which owns the rest of the Appling County WMA, later spotted it at the cavity. Silver Lake WMA near Bainbridge is the only other DNR property with red-cockaded woodpeckers. TNC’s acreage at Moody has an active group. 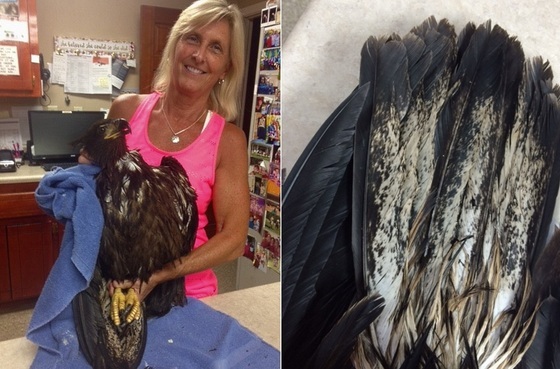 Heard about the bald eagle caught in fishing line and rescued by kayakers on the Etowah River? The eagle, held above by rehabilitator Kim Kilgore, was a first-year bird, an age marked by characteristics such as mostly brown coloration with some white mottling, including on the tail, writes Nongame Program Manager Bob Sargent. Bald eagles don’t acquire a full white head and tail until 4 to 5 years old, an age this one now has a chance of reaching. A second bat with the fungus that causes white-nose syndrome has been found in Washington. Unlike the little brown bat discovered with the deadly bat disease in March, a dead silver-haired bat from the same county has since tested positive only for the fungus Pseudogymnoascus destructans, still an alarming sign for western bat populations. 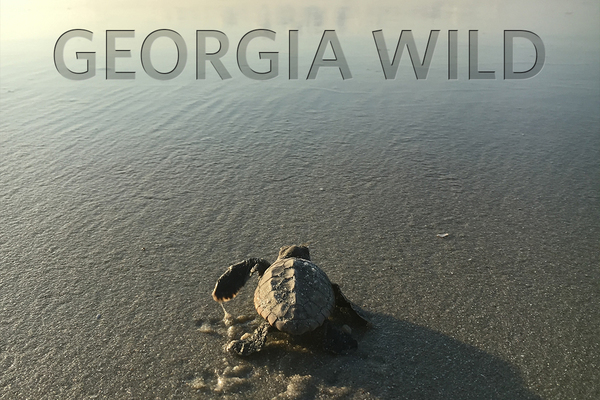 The Georgia Wild e-newsletter won first in the external newsletter category at this year’s Association for Conservation Information conference. The Public Affairs office of DNR's Wildlife Resources Division also placed first in graphic design (for the 2015 Weekend for Wildlife logo) and promotional campaign (wildlife license plates), and third in online community engagement (license email campaign). Fans of Terry W. Johnson’s “Out my backdoor” column, featured here monthly, will want to explore his blog, Backyard WildlifeConnections. Sponsored by The Environmental Resources Network, or TERN, friends group of the Nongame Conservation Section, Johnson's blog explores everything from clymene moths to that age-old question, do birds sweat? Need a break from the heat? Watch the bear and salmon cams streaming life from Alaska’s Katmai National Park, courtesy of the U.S. Department of the Interior. Names in the news: Jenifer Wisniewski, marketing and communications manager for the Wildlife Resources Division, has been elected vice president of the Association for Conservation Information. The national organization is made up of communicators representing state and federal wildlife, parks, and natural resource agencies as well as private conservation organizations. DNR Law Enforcement Division Cpl. Casey Jones received the North American Wildlife Enforcement Officers Association Officer of the Year award, presented at the organization’s conference in Vermont. This marks the second time in three years DNR has won the national award. Ranger 1st Class Patrick Gibbs, assigned to Long County, has been named the division’s 2016 Torch Award recipient, presented annually to encourage the professional development of recently appointed rangers. The Exchange Club of Brunswick honored DNR Ranger 1st Class John Evans and other area law enforcement as part of the club's Police Officer of the Year Luncheon. – Substitute manatees boost tracking project. – Terry W. Johnson on Devil’s darning needles. "Scientists study manatees' habits off Georgia's coast," WABE-FM (90.1, Atlanta). Also: The Brunswick News. Georgia Plant Conservation Alliance members including DNR and six other organizations recently spent a work day at a northeast Georgia mountain bog, checking on rare plants and removing other plants crowding the bog or rare species outplanted there. Mountain bogs are one of the Southern Appalachians’ most critically endangered habitats. 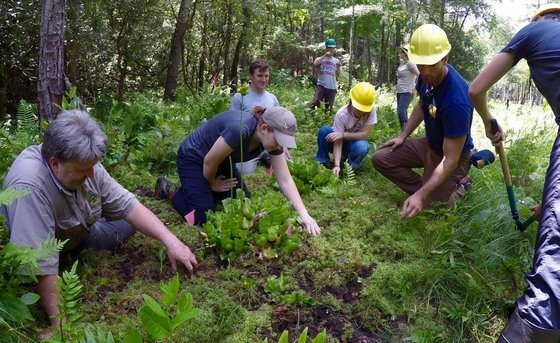 The Georgia Plant Conservation Alliance is restoring, managing and safeguarding plants and habitat at 10 mountain bogs in Georgia.